The rent at Washington Park Apartments ranges from $695 for a one bedroom to a $985 one bedroom. Apartments in this building are about as expensive as the Iroquois average. This is a pet-friendly apartment. This apartment is in the Iroquois neighborhood in Louisville-Jefferson. The closest park is Iroquois Park. Washington Park Apartments has a Walk Score of 68 out of 100. This location is Somewhat Walkable so some errands can be accomplished on foot. Elements of Louisville is a contemporary rental community nestled in a cozy scenic surrounding. Each townhome has private front and rear door entrances, full basements and hook-ups for your washer and dryer. We are conveniently located with homes that provide you with all of the comforts and privacy of owning your own home. 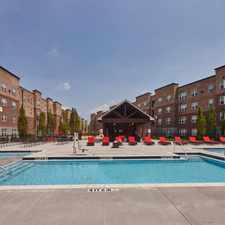 Located close to Iroquois Park, Elements of Louisville creates an affordable living experience designed for any lifestyle. At Elements of Louisville, a peaceful park-like setting and privacy await you. Please call for an appointment today. Explore how far you can travel by car, bus, bike and foot from Washington Park Apartments. Washington Park Apartments has some transit which means a few nearby public transportation options. Car sharing is available from RelayRides. 418 Marshall Walk compared to all of Louisville-Jefferson. How do you feel walking near 418 Marshall Walk? Washington Park Apartments is in the Iroquois neighborhood. Iroquois is the 40th most walkable neighborhood in Louisville-Jefferson with a neighborhood Walk Score of 47.